This is a short post about how Nikola Tesla used his imagination to create some of his most famous inventions. While recently going through a Product Hunt book collection posted by none other than Mr. Mars, Elon Musk’s Favourite Books, one title stood out. It must have been an inspiring read for Elon. After all, the most successful electric car company in the world, Tesla, was named in honor of this great inventor. The book starts off by going through Tesla’s early life in Serbia. Born the son of an orthodox priest, Tesla nearly became a missionary himself. Thankfully, his father had the good sense to send him to an engineering polytechnic in Graz, Austria where he began to develop his love for theoretical and applied electrical engineering. Tesla’s early life is interesting and tragic (his brother died horse-riding when they were kids and his father at a young age too). It then tracks his emigration to the US and chronicles his early years as a hungry yet voracious innovator in New York working in the Edison company. The book really gets interesting though when it starts to unravel how Tesla created some of his most famous inventions such as the AC Induction Motor and the Tesla Coil. How Tesla invented was a magical combination of imagination, theory and persistence. Imagination — Tesla would likely have been diagnosed as on the spectrum in modern society. He claimed that he often had ‘visions’ so strong that he had to force himself to distinguish what was real and what was imagined. This imaginary zeal never left him and contributed to some of his most brilliant moments of inspiration. Designing in his mind’s eye — Tesla could design an invention in his mind’s eye without the aid of drawings or designs. He would mould products in his head and test out different variations. This happened well before he’d actually built his inventions in the lab and tested them. It was the combination of these three forces that drove Tesla to become one of the most important inventors of all time. In modern terms, we’d classify Tesla as the difficult genius who could move mountains to finish what he had started. Do these traits remind you of anyone? The most fascinating takeaway from the book is how Tesla adapted the world to his perspective. The author Carlson uses an analogy from The Innovator’s Dilemma to describe how Tesla differed from other inventors of his day. This type of innovation is focused on optimisation. It’s about squeezing every possible efficiency from a given product. You take what already exists, tweak it and make it more efficient. The main conclusion from The Innovator’s Dilemma is that some great companies fail due to the fact that they focus on incrementally improving an existing process that is working for them. Managers want to make more revenues. They keep working on what is selling but this leads to a innovation blindness and technological stagnation. The innovative lifeblood that made the company in the first place disappears and this optimisation phase actually causes their downfall. They try to satisfy a growing market and the company eventually gets disrupted by a another startup with better technology. The semiconductor industry is a good example here. As Carlson explains, adaptive innovators are made of different stock from disruptive innovators like Tesla. They start from the outside and work their way towards a product. Market research, competitive analysis and verified data is needed to shape the product that they create to capture that market. It’s an extroverted approach to invention. This type of innovation is focused on creating something completely new. It’s about intuition, imagination and creating markets that don’t exist. More often than not, the founders of these companies are too far ahead of their time. They have a vision for the way that things should work and they venture out to shape this vision into reality. Often the products they create will fail due to a lack of customers. The inventions might be brilliant but they can’t be commercialised at scale. But sometimes these moonshots change the face of technology. The AC Induction Motor falls into this category. Carlson describes Tesla as a disruptive innovator. He started from the inside and made the exterior world adapt to his vision of the future. There was no market research or consumer insights studies backing up his hunches. Tesla took a contrarian stance at the time. He hitched his wagon to the AC star even though the streetcars of the time were all using DC motors. It was an introspective approach to invention. Tesla and his financial backers sold his patent to Westinghouse Electric and Manufacturing Company for $60,000 ($1,584,000) in today’s dollars) in cash and stock with a royalty per AC horsepower produced by each motor. Westinghouse also hired Tesla for a large fee of $2,000 ($52,800 in today’s dollars). 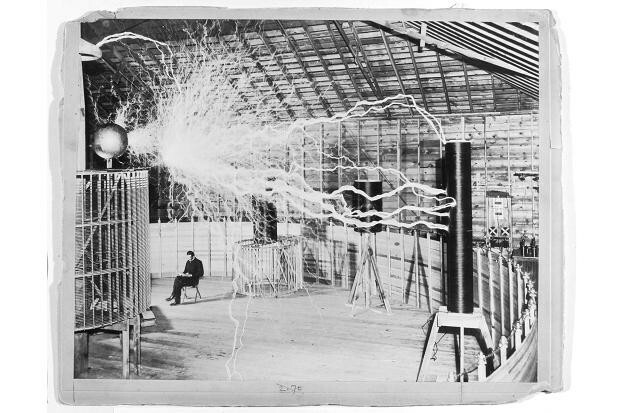 This seed money allowed Tesla to work on some of his other inventions such as the Tesla Coil and his contributions to X-Ray and Radio. His blind faith in his own disruptive process paid off. At Retro Patents, we’re inspired by the people who see the world a little differently. Those who realise that they can step outside of the status quo and crate a version of the future that they’ve imagined.